The Temple of Athena is no more a temple but the site of ruins of an ancient temple that was build hundreds of years ago. The place is situated in the Canakkale Province of Turkey and is a very popular tourist attraction of the place. The reason for its popularity is mainly the view of the surroundings from this place. The view of the sunset as well as the sunrise is spell-bounding. 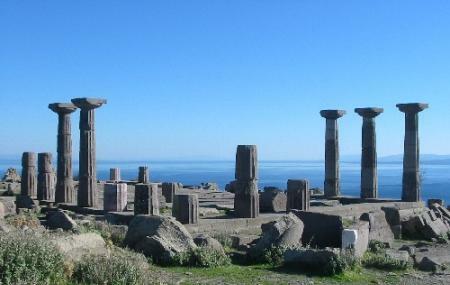 What remains here now are just a number of pillars from the lovely temple dedicated to the Greek Goddess. The pillars still have the lined Greek architecture traces and have a bottle shape. The place is very peaceful and refreshing with the cool breeze. How popular is Temple Of Athena? People normally club together Akvaryum Koyu and Naval Museum while planning their visit to Temple Of Athena.